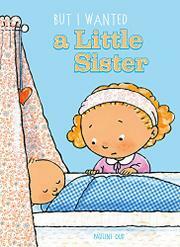 A young tot learns how to cope with the disappointment of having a brother instead of a sister. Sophie has a new baby in her family, and more than anything she wanted a little sister. But that didn’t happen. Quick to find a solution, she turns her brother into Pretend-Sister. Pretend-Sister doesn’t mind wearing pigtails or pink, frilly doll dresses. Pretend-Sister also loves to play with beaded necklaces and paper earrings. But one day Mommy cuts Pretend-Sister’s hair and Pretend-Sister outgrows the doll dresses. In a tantrum, Sophie takes her brother to town in an attempt to trade. Many other tots are willing to give up their crying, pesky little sisters—and Sophie realizes how lucky she is to have her brother after all. Sophie, her little brother, and almost all of the other kids are white (round-faced with button noses) except for one family with darker skin. Paisley, polka dots, and plaid adorn the pages, and muted tones never overwhelm. The one misstep in this Dutch/Belgian import is that gender stereotypes abound. Sophie’s brother does continue to wear pink dresses sometimes (when he is still pretending to be a girl), but he much prefers a pirate costume.